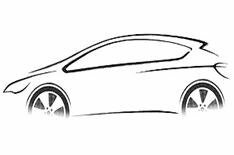 First images: Vauxhall Astra | What Car? These are the first teaser images of the next Vauxhall Astra, which will go on sale early in 2010. Although the images give little away, Vauxhall says the new Astra will take styling cues from the Insignia, using details such as the distinctive wraparound dashboard to give the car a premium feel. It will also be available with new technology from the Insignia, including the Front Camera System that can recognise road signs, and Adaptive Front Lighting, which changes the headlight beam according to lighting conditions and weather. The engine line-up is expected to be made up of new units that offer more low-end pulling power and improved fuel consumption. The new Astra will be unveiled in the metal at the Frankfurt motor show in September 2009. Five-door models will go on sale initially, and sporty three-door models following later in 2010.